The University of Minnesota Solar Vehicle Project team made history in August 2016 as the first team to race a two-seater Cruiser Class car in the American Solar Challenge cross-country solar car race. The team also won the "Spirit of the Event" award for their pioneering efforts racing a practical multiperson solar car. The 2016 American Solar Challenge was an eight-day, 1,975 mile road race. The course started in Cuyahoga Valley National Park in Brecksville, Ohio and ended in Wind Cave National Park in Hot Springs, S.D. Along the way, solar cars raced through Indiana, Missouri, Kansas, and Nebraska, stopping at nine National Parks along the way as part of the National Parks Services' Centennial Celebration. See photos of the race by clicking on the slide show below. Despite bad weather and motor problems, the team finished fourth in the Formula Sun Grand Prix track race and 10th overall in the cross-country race. With the disadvantage of a two-seater Cruiser Class car, the main goal was not to win the race, but instead to showcase a new class of car in the race. 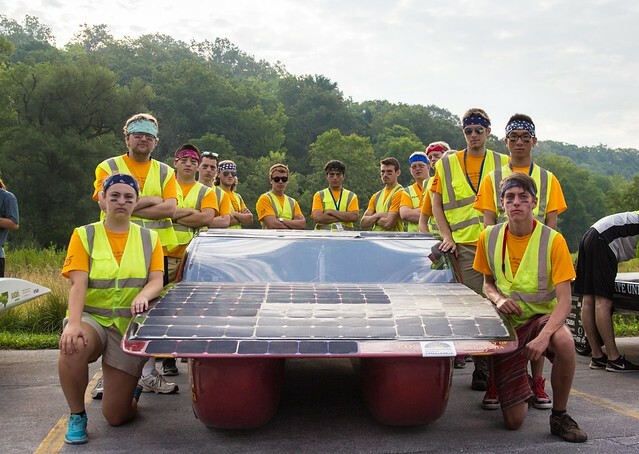 "We are participating in order to show everyone who follows this event that solar cars don't have to be uncomfortable looking, gawk-worthy machines, but that they are also moving toward being practical and are likely the future of automotive engineering," the team said on their blog. The team is sponsored by several companies and individuals including PTC, 3M, Infolytica, Ansys, Panther Precision, Windings, Inc., and Quantronic. Alumnus Bob Eddy serves as the team's Advisory Board chair and is and individual sponsor. Read more about the team's race experience on their blog. Adopt a solar cell or donate to the team. The University’s Solar Vehicle Project is funded primarily by donations. Find out how you can adopt a solar cell or donate to the team.